Green Island has a tropical climate so anytime of the year is a great time to visit. Temperatures are warm all year round, allowing for a wonderful relaxed outdoor lifestyle, and plenty of activities to choose from. We don't really have four distinct seasons, rather they blend into two - summer/winter or wet/dry. A typical North Queensland tropical climate brings clear, fine days during our 'Winter' months (June - August), and hot and humid conditions during our 'Summer' months (December - February), with much of our annual rainfall falling between January - March. Even though our wet season builds up to tropical showers and thunderstorms, it is one of the most beautiful times to visit the region, as the rainforests are green and lush and all the creeks and waterfalls are in full flow. An advantage for holidaying in the wet season is that the region is not as crowded, low season rates apply, and quite often you'll get to experience superb weather inbetween the rain showers. 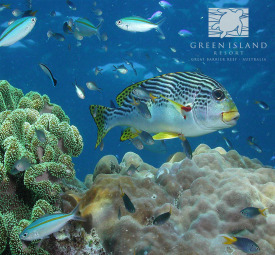 It is also an ideal time for visiting the Great Barrier Reef as water temperatures are a luxury 29 degrees, and low wind and ideal water clarity provide perfect conditions on the reef. Don't worry if does happen to be raining in Cairns, the rain tends to draw towards the mountains, and more than likely it will be clear and fine at the reef! Our winter or dry season is the most popular time for visitors; whilst it's cold in the southern states, we're enjoying glorious weather with comfortable temperatures throughout the day. Even though it is the coldest time of the year for us in the tropics, our temperatures can rival many other places around the world in their summer! The water temperature at this time of year dips to its coolest at around 24 degrees. The southern trade winds usually occur during this time, so remember your sea sickness tablets if you're prone to sea sickness. Whilst most of the year provides ideal conditions for visiting the Great Barrier Reef, we would have to say our favourite time is between October to December after the trade winds and before the heat of summer and monsoonal season. We're very laid back in the tropics so casual and comfort is the style of choice. Bring something light and cool - shorts, light-weight shirts, singlets, sarong, sandals and flip flops/thongs for the beach. In the evenings smart casual is the accepted dress, no need to bring suit, tie or cocktail dress unless you're coming up for a special occasion. During our cooler months June to September you may want to bring something long sleeved for the evenings. Most importantly remember your SPF 30 sunscreen, swimmers, sungalsses, hat, paw paw lotion and mozzie spray just in case. 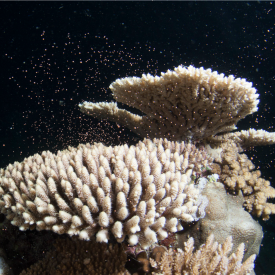 On the reef: Summer is breeding season on the Great Barrier Reef. Green turtles are nesting and hatching. 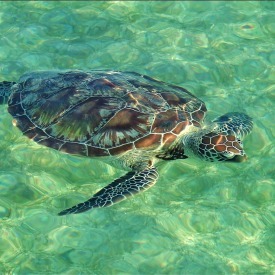 Green Turtles are often spotted grazing amongst Green Island’s significant seagrass habitat.